This pineapple salsa with lime and cilantro is the perfect addition to your next BBQ! Or serve it with tortilla chips for a delicious snack or appetizer. It’s very easy to make, fresh, and packed with flavor! I’m so happy summer is finally here and we can enjoy time outside again! This winter was just waaay too long. So I can’t wait to make fresh and easy summer recipes and share them on the blog with you. Summer, here we come!! Last week, we had a BBQ with some friends and I made a huge bowl of this pineapple salsa with red onions and bell pepper. And let me tell you, it was a real crowd-pleaser! To make it extra stunning, serve it in a fresh pineapple like I did. I mean isn’t that just the nicest “bowl” ever? Plus, it’s all natural and you don’t even have to bother with cleaning up after everyone is done. Haha! I’ve already done this for my Thai pineapple fried rice before. Pineapple salsa is usually served with grilled meats or grilled chicken. I’ve also seen that a lot of people search for pineapple salsa for salmon or fish in general. But it’s just as good with grilled tofu or homemade vegan burger patties. And of course also with tortilla chips! And we’ve also used it to make lettuce wraps once. This is perfect for a light lunch on hot summer days! The ingredient list for the salsa is very short and you can find all of the ingredients in every grocery store. As always you can find the full ingredient list and the detailed recipe instructions in a separate recipe box at the end of this post. The recipe for this salsa couldn’t be easier! It’s ready in about 15 minutes. I love serving the pineapple salsa in the pineapple itself. But of course you could also serve it in a regular bowl. But it looks just sooo much fancier in a pineapple bowl, don’t you think? STEP FOUR: Cut the removed pineapple pieces without the core, the tomatoes, and the bell pepper into small pieces. Finely chop the red onion and the cilantro. STEP FIVE: In a large bowl, combine all ingredients for the pineapple salsa and stir in the lime juice. Season with salt, black pepper, and red pepper flakes. Serve the pineapple salsa in the pineapple bowl. For an even more colorful version, use a mixture of red, yellow, orange, and green bell peppers. If you’re making the recipe for a larger crowd, double the recipe. This way you can frequently refill the pineapple bowl. Either serve the pineapple salsa as an appetizer with tortilla chips or with grilled food. It’s also a great addition to wraps or even lettuce wraps! I usually use fresh lime juice, but if you don’t have fresh lime juice on hand you could also use store-bought lime juice. If you want to make a spicier version, you can also add diced jalapeños. But better go easy on them! 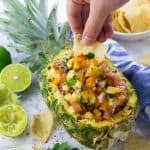 I wouldn’t recommend using canned pineapples for this salsa because it’s just sooo much better with fresh pineapple! I hope you like this recipe as much as we do around here! Please let me know if you give it a try and leave me a rating and a comment below. As always, I love hearing from you guys and seeing your Vegan Heaven creations on Facebook and Instagram! Check out these posts if you’re looking for more vegan BBQ and grilling recipes or sides such as vegan pasta salad recipes. If you’re looking for more salsa recipes, I’m sure you’ll love this roundup of 50 salsa and guacamole recipes. This pineapple salsa with lime and cilantro is the perfect addition to your next BBQ! Or serve it with tortilla chips for a delicious snack or appetizer. It's very easy to make, fresh, and packed with flavor! Start by making the pineapple bowl. Cut about 1/3 of a fresh pineapple off using a sharp knife. With a sharp knife, make a cut around the edge of the pineapple to make the pineapple bowl. Be careful not to cut through the bottom of the pineapple. Cut the pineapple into six pieces. Carefully use a spoon to remove the pineapple pieces. Congrats, you've got a pineapple bowl! Cut the removed pineapple pieces, the tomatoes, and the bell pepper into small pieces. Finely chop the red onions and the cilantro. In a large bowl combine all ingredients for the pineapple salsa and stir in the lime juice. Season with salt, black pepper, and red pepper flakes. Serve the pineapple salsa in the pineapple bowl.